Braids have come a very long way since the turn of the century when they were popular among servants and nobility alike. The servants, who wore styles that would be considered casual by today’s standards-wore what we now refer to as “a crown” of braids, in which either a single braid or multiple braids were worn around the crown of the head, which is where the term originated. The nobility wore much more elaborate braided styles for everyday and more elaborate still for formal occasions. Of course, they had someone to arrange their hair for them, but then we have our hairdressers to weave that kind of magic for us. Magical those braids can be too! There are a myriad of braided styles these days, everything from a standard, casual braid to very ornate, elegant braided up dos to rival any 19th century Noblewoman! Ashley Tisdale’s braided half up do is very pretty as a casual or beach look, or could be dressed up for a formal occasion either by braiding more intricately and neatly and/or by adding hair adornments throughout the braids. A long curly style with a partial French braid, such as this one seen on Paris Hilton is a great idea for a wedding or any formal occasion. It would also be very eye catching with sparkling hair jewelry added for additional flair. If you are looking for something a bit different than others are wearing, this unique braided look worn by Kristen Bell may be just what you are looking for! 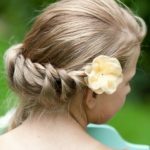 The French braid begins on one side of the head and travels across the top to the back on the opposite side, leaving the end to fall into the back-with a couple of well placed spring curls in the front for an added bonus. The mixture of textures in the braid and curl makes this a very interesting style with lots of visual appeal! If you are partial to the messy styles, then you will like this messy version of the “over the shoulder braid”, seen here on Alysson Paradis. You could wear the braid in a French braid, a twist, a regular braid or a herringbone braid as shown in the photo. 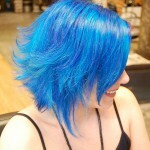 If you happen to have highlights, it showcases them quite nicely as well. Miss USA-Alyssa Chapman, seen here wears one of the season’s hottest trends, a hair adornment-as she shows that ribbons are not just for little girls anymore! Alyssa donned a black satin headband, and then wove it through her long side braid; the black satin ribbon is a chic contrast to her gorgeous, deep auburn hair. 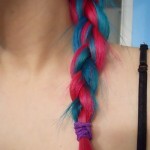 The braid for this style can be any sort you like, French, standard, or herringbone.